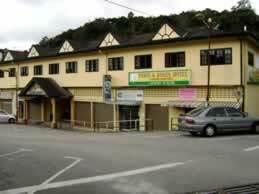 Here’s another hotel in Brinchang Cameron Highlands, named after a rose. Could it be because of the plenty rose farms in the highlands or the fact that minister has declared Brinchang as the town of roses back in 1989? Anyways, the hotel is located in a quieter corner of Brinchang but yet, it is still within walking distance from the many restaurants that are serving good food and the must visit night market. Well, if you aren’t too sure about the exact location, follow the signboard directing you to Cameron Organic Produce Restaurant because the hotel is located on the same road. The yellowish building catches your eye from afar so, it won’t really be a problem to spot it once you get to the right street. Even though the hotel occupies only one floor of the shop lots, guests would be surprised to find plenty of rooms along the corridor. However, if you are looking for single or twin sharing rooms, then unfortunately you have to head to other hotels because there are only quad and octa sharing rooms. Therefore, this hotel is suitable to those who are travelling in groups. Room rates start from RM130 per night for quad sharing rooms while rates for octa sharing rooms range between RM160 and RM270 per night. Address: P.O.Box 4, Brinchang, 39100 Cameron Highland, Pahang.